ACT Forklift: Family Road Trips -Ahh, the memories! Family Road Trips -Ahh, the memories! Do you remember those road trips during the holiday season? Some of those trips were short, some long, and some took most of the day. The kids in the back fidgeting, fighting, and asking "Are we there yet? every 30 minutes. Can you imagine riding in your car on a torn seat during an 8-hour road trip? That would just add to the family experience and probably would have everyone in a bad mood by the time we get to grandma's house. If your forklifts have old seats, we are essentially asking the same of our forklift operators – every shift, every day. The loss of the seat’s cushion and support creates an uncomfortable ride with exposed foam and wires, and increases excessive vibration. As the shift goes on, operators become sore and irritated which then decreases productivity. 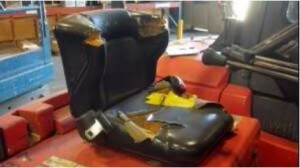 A damaged forklift seat may also pose a larger problem if the seat belt doesn’t work. During an OSHA audit, a non-working seat belt can result in a fine under the General Duty clause of 1910.178. More importantly, a restraint system can be a life-saver in an event of tip-over or the forklift being driven off a dock. Take a minute to review your forklift fleet and their seat condition. When it comes time to replace your forklift seats, don’t be fooled by low-cost generic brands. 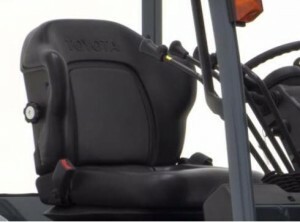 To keep your operators as comfortable, safe and productive as possible, trust Toyota Genuine Forklift Seats. For more information on forklift ergonomic accessories, contact ACT at www.actforklift.com. Back Up, and do it right.